Through a simple saliva sample, uncover your unique diet & fitness profile and understand your risk for 8 common cancers. Sign up to our newsletter to receive exclusive offers, invites to special events, and more! Uncover your personalised diet, nutrition and exercise profile across 17 categories. Learn about your risk of 8 common cancers - including breast, ovarian, and colorectal. Comprehensive insights into your needs and sensitivites to help you personalise your diet, fitness routines, and lifestyle. Receive a 30-minute phone consultation with one of our genetics-trained health coaches. Take your DNA results on the go with our exclusive mobile app. Learn if you carry a gene mutation associated with an increased risk of eight common cancers, including breast, ovarian, colorectal, and more. Learn about how you could proactively manage your health, based on your genetic risk and needs. Every kit includes a 30-minute phone consultation with one of our certified Genetic Counsellors. Receive your DNA kit at home. Collect saliva sample and mail it back, FREE of charge. Your DNA results will be ready within 2-3 weeks! "Genetics and nutrition firm DNAFit advises on how we should be training and what we should be eating after testing our genes and applying its algorithm to the analysis." "DNAfit offers genome-personalized workout and nutrition advice including diet plans, grocery lists, and a workout app..based on your genetic muscle type, endurance level, and risk of injury. " "Impressively, in just over a week following their recommendations, I went down a clothes size, which convinces me that knowing your body’s needs at a genetic level is a huge leap forward." Receive exclusive tips and advice, product updates, invites to special events, promotion codes, and more! 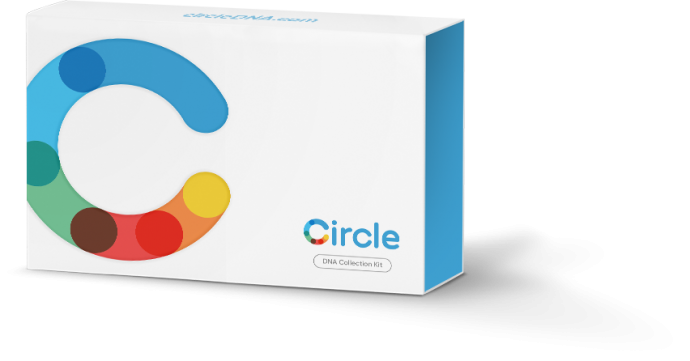 Circle and DNAFit are trademarks of Prenetics Limited. All other trademarks referenced herein are the property of their respective owners.